During the month of October, I pretty much abused and neglected my body. While in Hong Kong, my diet consisted of carbs for breakfast, lunch and dinner with a splash of protein here and there. After I got back, I was pretty much bedridden and on the "I'm too sick to care what I'm eating but not sick enough to lose my appetite" diet for a week. Now that I'm back on my feet, I'm ready to do some heavy body detox. 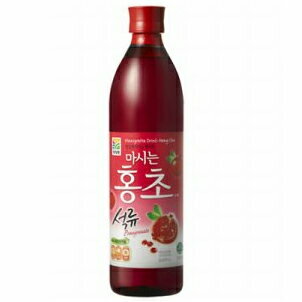 I'm kick starting my diet reset by downing a cup of Hong Cho pomegranate red vinegar drink every morning. The vinegar is supposed to help flush out toxins and promote a healthy metabolism. I love the tangy pomegranate flavor and the drink keeps me full and full of energy in the mornings. Here's to finishing 2010 on a healthy and strong note! I have been drinking this as well. Mainly for detoxing. When I came to Korea I gained weight and other cultural factors have left me feeling less healthy than I was back in the states.I can't tell if it's working or not. It's summer so I'm going to feel crappy either way. I don't like this season. I mix this with five parts sparkling mineral water for an incredibly refreshing drink. Not sure about the health effects. I just know it's delicious. Too bad it costs $13 a bottle in my town. is this Hong Cho vinegar drink contain Alcohol....??? Where can I buy in Belgium? ?